Alphonso Mango (also known as “Hapuz” “Hapus” or “Hafooz” locally) is called the “King of Mangoes” by its proponents. The most sought after Alphonso mangoes are the Ratnagiri Alphonso and the Devgad Alphonso, which are grown in the Ratnagiri and Devgad regions of India respectively. The 200 km belt on the west cost of India between Goa and Mumbai (also known as the Konkan region) has just the right soil and climate that allows an exceptional fruit to form. The Ratnagiri and the Devgad Alphonso is sometimes called the “King of Kings”, although opinion is divided over whether this refers to the Ratnagiri Alphonso or the Devgad Alphonso. However, both are majestic fruits and we get both of them. The Ratnagiri Alphonso is available at the beginning of the season and the Devgad alphonso is available towards the end of the season. Fibreless, extremely fragrant, delicious- everything you did not know even existed in a fruit. Yummy, sensitive and temperamental, it is said that every person in the Alphonso belt has a secret desire to taste at least one Ratnagiri-Devgad Alphonso in a season- otherwise what is life worth living for!! Alphonso is also grown in other regions of India, such as Karnataka. Farmers in the US, Mexico and South America have also tried to grow the fruit, with varying degrees of success. However it is extremely temperamental and sensitive to the weather. Some say it is called the King because of its temperamental nature. Despite all this, this is our top selling mango every season and beats every mango hands down. The first flowering of Alphonso mangoes generally matures in February and the second flowering is generally ready in April. Its peak season is from mid-April to mid-May. 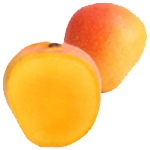 We get most of our supply of Alphonso mangoes from top orchards in Ratnagiri and Devgad.